BROTHER duo Ally and Grant Fraser, Nairn, took a host of prizes and also secured the day’s top price at the Young Farmers over-wintered cattle show and sale at Thainstone. Ally Fraser with the champion which also topped the sale at £3,400. 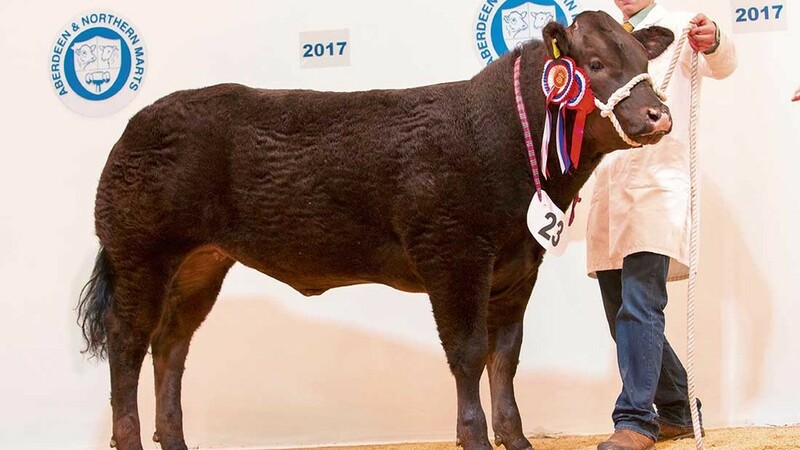 Leading the championship was Ally Fraser with a 13-month-old 484kg Limousin cross heifer, which later topped the sale at £3,400, selling to an undisclosed buyer. The second highest price of £2,400 was hit twice. First was Darren Davidson, Keith, with his 10-month-old 412kg Limousin heifer, which was bought by W. Robertson, Ballindalloch. At the same money was Grant Morrison, Keith, with a 10-month-old Limousin heifer which weighed 400kg and went home with J.J. Duffton, Huntly. Picking up the award for the best presented beast was Gary Morrison, Keith, with an 11-month-old Limousin heifer weighing 446kg, which also sold for the third highest price of £1,750. The buyer was G. Cameron, Argyll. Taking the steer championship for the second year in a row was Grant Fraser with an 11-month-old Limousin weighing 452kg. It later sold for £1,280 to Emslie’s Livestock, Peterhead.